It’s undeniable that reading is the most effective way to get new vocabulary. When you read, you see words being used in context — and that’s what makes it much more effective than, for example, merely memorizing word lists. With context information surrounding each new word, there’s a good chance you can guess its meaning just by understanding the overall text. Finding out the meaning of words in such a way is the natural way of learning language – and reading provides the best opportunity to get exposed to this natural way of learning. If you’re not able to infer the meaning of new words when reading, it’s probably because there are too many unknown words in the text. In that case, try reading easier materials. The key to good reading is making it a pleasurable activity; so don’t be afraid of coming across unknown words, but make sure the text is appropriate for your reading level. A dictionary is the first indispensible resource to improve your vocabulary. It’s only by looking up a word in a dictionary that you will learn its precise meaning, spelling, alternate definitions, and find much more useful information about it. A thesaurus is also a valuable resource for learning by finding connections between words, such as their synonyms and antonyms. The Oxford American Writer’s Thesaurus. Answers.com, Dictionary.com, The Free Dictionary and many others: All of them are good resources – try each one at least once to help you make up your mind. Don’t settle after you learn a new word by reading it or looking it up in the dictionary: these are good starts, but it’s by using the new words that you truly commit them to your long-term memory. It’s also important to be aware of your own language style: every time you catch yourself saying common or nonspecific words such as “nice”, try coming up with richer and more precise expressions instead. If you learn just one new word every day, you’ll soon notice they add up pretty quickly. I like to think of it as the “kaizen way of growing your vocabulary" and what makes this strategy stand out is that it can be used by anyone, no matter how busy one’s schedule is. In the same way I grow my collection of favorite quotes in baby steps by receiving a new famous quote every day, I also learned to enjoy growing my vocabulary by committing myself to learning at least one new word each day. Dictionary Word of the Day: Another fine service, not as complete as Merriam-Webster’s or WordSmart, but still worth checking out. By deeply understanding words, you can make your vocabulary grow exponentially. Instead of just memorizing words, try to really understand them by looking at their etymology, word roots, prefixes and suffixes. At least half of English words are derived from Greek and Latin roots, so there are enormous benefits in being familiar with them. Understanding the logic behind words always pays off in terms of learning and recalling. Consider the examples: “breakfast” meaning “interrupt the night’s fast”; or “rainbow” meaning “bow or arcg caused by rain”: while these meanings may be trivial to native English speakers, having such insights about words, foreign or otherwise, never fails to delight me. By keeping a personalized list of learned words, you’ll have a handy reference you can use to review these words later. It’s very likely you’ll want to go back and refresh your memory on recent words, so keeping them in your own list is much more efficient than going back to the dictionary every time. Even if you never refer back to your lexicon again, writing words down at least once will greatly enhance your ability to commit them to your permanent memory. Another excellent learning aid is to write an original sentence containing the word — and using your lexicon to do that is a great way of enforcing this habit. You can also add many other details as you see fit, such as the date you first came across the word or maybe a sequential number to help you reach some word quota you define. There are many ways you can keep your personal word list; each one has its own advantages and disadvantages – so make sure to pick the format that works best for you. You may prefer to keep it as a simple text file in the computer, or in a regular paper notebook; or maybe as flash cards in a shoe box. My format of choice is a computer spreadsheet, for its handy features such as searching, sorting and filtering. For each word, I have columns for the date I learned it, a sample sentence, along with a link to its definition in an online dictionary. Lately, I’ve also been experimenting with keeping my personal lexicon in a concept map. This has been working particularly well so far, and I plan to explore the technique in more depth here when I get more conclusive results. To make vocabulary improvement a permanent habit in your everyday life, you should make it as habitual, automatic and tightly integrated in your daily workflow as possible – otherwise you won’t do it when your days get too busy. If you already adopt some kind of structured workflow for your life – such as David Allen’s Getting Things Done – you’re probably familiar with the idea of organizing all input that comes to your life in “buckets”: virtual inboxes that get processed in a similar way to your e-mail inbox. In that regard, one particularly useful concept is the one of maintaining a “Word Inbox”. By having a predefined place you use to capture the words you come across, you can process them much more efficiently. For example, my word inboxes, which I try to empty once a day, consist of my word-of-the-day feed and of notes on my PDA – which I use to capture any new words I discover during the day. Your process can be as simple as you wish – the key is to define it beforehand and then follow it. By knowing exactly how and how often to process your inbox, you stay on top of your vocabulary improvement process, even when there are other pressing matters crying out for your attention. Playing games and engaging in group activities are useful in any kind of learning, but particularly effective for language-related learning. 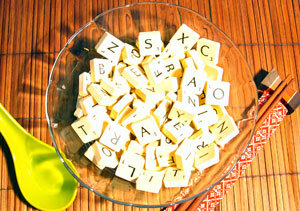 Gather your family and friends and play word games together. Some interesting options are Quiddler, as well as the classics Scrabble and Boggle. If you don’t want to spend money on boxed games, it’s easy to come up with your own word activities. You may, for example, try your own variation of “Word Evening”: at a specific day of each week, a different person brings a new word to the meal. The person reads the word, defines it, and the others must come up with a sentence using the word. Word Games on Yahoo! Games. The Internet is a gold mine of resources for vocabulary building. The links I collected here are just my personal recommendations and don’t even scratch the surface of what’s available online. The point is that you’re only limited by your willingness to learn: let curiosity be your guide and you will never run out of resources to learn from. Do something different from your daily routine: hunting, fishing or blogging – any activity that is not a part of your normal life can become a great way to learn new words, as every niche has its own jargon and unique ways of communicating. Read different books and magazines than the ones you’re used to. Watch foreign-language movies. Take up new hobbies, hang out with different people. By doing things out of the ordinary you will not only improve your vocabulary but also make your life much more interesting.